Interlaken gets its name from being between two lakes; in the east there’s Brienz, and in the west is Thun. But though they feature in the name, it’s not all about the lakes in this beautiful Swiss town. 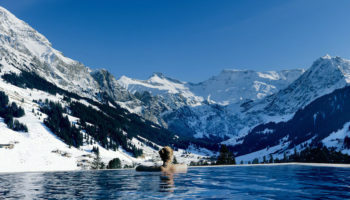 The water element certainly adds to the outdoorsy appeal of Interlaken, but it’s the mountain setting that really makes this place as wonderful as it is. 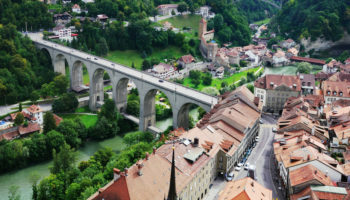 Surrounded by jagged, snow-capped peaks, the charming streets, historic buildings, and chalet-style architecture in town are the cherry on top. 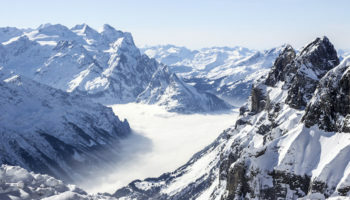 Staying in Interlaken isn’t as hard as scaling a mountain, either. First of all, there’s more than one train station serving this picturesque area – plus a bus system. And accommodation? There’s a lot to choose from, with budget lodgings as well as amazingly grand and historic hotels on offer here. This historic hotel has been serving guests since 1801; it’s a grand building with a backdrop of lake and mountains. Inside, period features have been retained, but with a definite focus on modern, boutique details, featuring minimalist style and sleek yet simple furnishings. You could even choose to stay at an apartment or cottage – both lakeside – which come with kitchens for extra convenience. Speaking of which, this heritage hotel is located just a five-minute walk away from Interlaken-West train station. 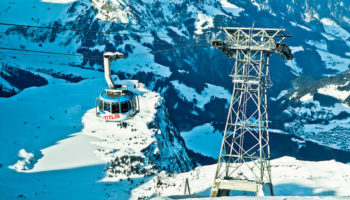 It’s also a short stroll to the Tourist Museum of the Jungfrau region, where you can learn all about how skiing and tourism developed in the area. Set in a large, old building, Hotel Du Nord comes with a few complimentary perks that make staying here great value for money. For a start, you can borrow a bicycle for free and pedal around the area. You also get a complimentary breakfast and free parking, as well as transport tickets for the local area. Doesn’t that just sound perfect? Aside from that, the rooms are whitewashed, simple and cozy; you can upgrade for a balcony, too. It’s practically next door to Schloss Interlaken and the attached Schlosskirche Interlaken, both centuries old. 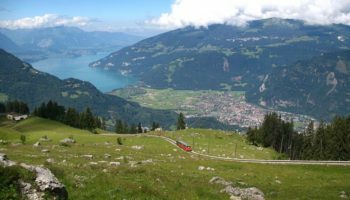 For even more convenience, it’s less than a ten-minute walk to the nearby Interlaken-Ost train station. Complete with beautiful mountain views from its restaurant, a heated outdoor pool, and a garden with seating so you can simply enjoy the natural vista of the Leutschine valley, Hotel Berghof Amaranth also boasts a chalet style annex for extra coziness. You’ll find this hotel just over a ten-minute stroll from the charming Wilderswil village. The rooms here may be simple, but they’re warm and homely; if you book a room in the annex, the rooms are quaint and wood paneled. For budget-minded visitors, breakfast is complimentary. So is parking, which is good, since the nearest train station (Golden Pass Railway station) is just over four kilometers away. Though it’s set just under three kilometers from central Interlaken, when staying here, you won’t mind being slightly out of town. 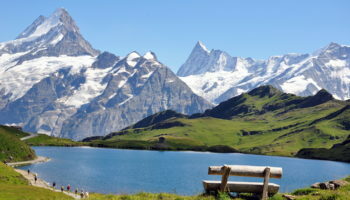 The views from Jungfrau Hotel are stunning, with mountain scenery all around. The hotel itself is fitting too, with chalet-style decor in its refined, polished rooms. With a restaurant on site and complimentary breakfast included in the room rates, you won’t have to worry about going hungry at this beautiful spot. 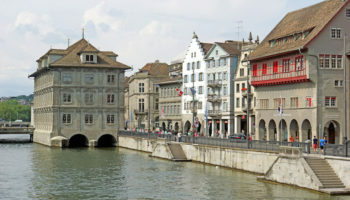 But if you do want to venture into town for a wider choice of restaurants, the Wilderswil train station is just a two-minute walk from Jungrau Hotel. 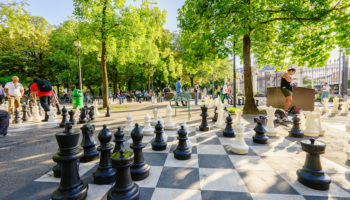 A well-located hotel, this 4-star offering puts guests within easy walking distance of shops, Interlaken-West train station, and a whole host of cafes and international restaurants. That said, there is a Swiss restaurant onsite at Hotel Krebs, plus a deliciously cheesy fondue restaurant and a cozy, warm bar. The rooms here are posh but simple. A mix of modern and traditional decor, floral fabric curtains meet minimalist furnishings, making for a refined yet relaxed stay. You can even upgrade for mountain views and balconies; though opting for a suite gives you extra room with a lounge area. It’s easy to get the bus around the area thanks to the stop at the train station. If you were looking for a historic place to stay in the already historic Interlaken, this place is it. 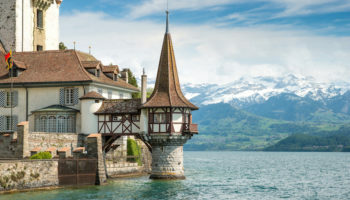 Hotel Interlaken actually began in 1323, when it was founded as a hospital. Over the years – becoming a tavern in 1491 – it’s played host to many celebrity guests, including composer Felix Mendelssohn and poet Lord Byron! 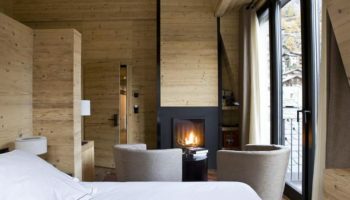 The rooms are beautifully up-to-date – a modern reimagining of Alpine atmosphere, featuring pine clad walls. There’s a rustic bar to enjoy onsite, too. It’s a leisurely stroll from here to Interlaken-Ost train station, but also Interlaken Harderbahn, which goes to Harder Kulm (1,321m) for the most spectacular views you can imagine. 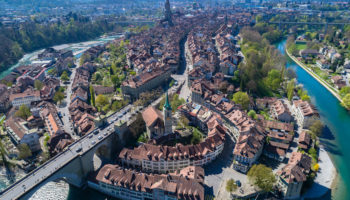 A mere six-minute walk from Interlaken-West train station, Hotel Beausite may not be all luxury, but it certainly comes packed with everything you need to enjoy a pleasant stay in this beautiful area. The rooms are equipped with mini-fridges, coffee machines, and some even boast mountain views; plus the onsite bar and bistro specialize in a delicious dish indeed: cheese fondue! What’s more, both breakfast and parking are complimentary, making this an excellent option for those traveling on a budget – or on a road trip. There’s also a bus stop just a few minutes’ walk from Hotel Beausite, but you could easily walk to all the international restaurants in the center of town. This is a stunning 19th-century hotel in a stately building, complete with a dining room decorated with ornate original features – like carved pillars, architraves, painted ceiling – and huge windows with incredible views. Jungfrau Hotel certainly knows how to do old world style. Not far from the Schloss Interlaken, there’s also a cigar lounge, an Italian restaurant, and a piano bar. You’ll also find an indoor pool and fantastic spa here – luxury at its finest. Needless to say, the rooms are refined and stylish. 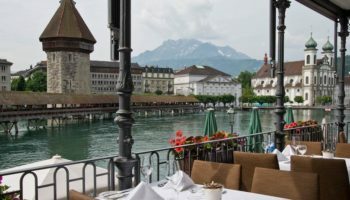 As well as being located a mere seven minutes’ walk from Interlaken-West train station, this hotel boasts one heck of an afternoon tea – possibly the best in Interlaken.